This product information page is designed to help you decide whether the Kärcher WT4 garden watering controller is right for you. It includes links to the top online retailers’ websites to save you time finding the best deal. 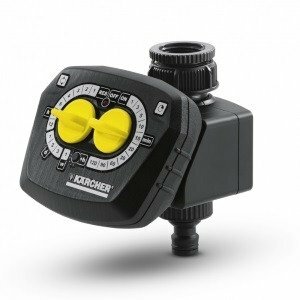 Where to find the best price for the Kärcher WT4 garden watering controller. A battery-operated tap-mounted watering controller allowing the user to select watering start time (to the nearest hour), watering frequency and watering duration. Allows user to set watering start time (to nearest hour). Allows user to set watering frequency. Allows user to set watering duration. Manual 'water now' button for 30 minutes of watering at any time. The Kärcher WT4 connects directly to a garden tap and to a hose pipe (which may in turn be connected to a garden sprinkler or an irrigation system).